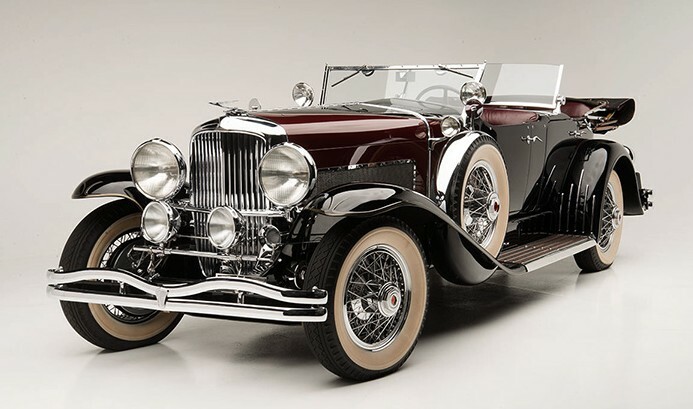 What’s a better way to start off the new year than with a Duesenberg? Well, actually, how about with a factory-supercharged Duesenberg? That’s right, this Duesey has a blower on it – and not one that was added later in life (well sort of). The story on this car is that it was bought new by one-time Indianapolis 500 participant Martin de Alzaga in 1929. He took the car to Argentina and the supercharger was added around 1935 – when Duesenberg was still in business. Alzaga didn’t use the car much and had the body converted in Buenos Aires to a race car (although the famous LeBaron “sweep panel” was still evident running down the car’s side. There are pictures out there and it’s a pretty wild sight). In 1965, the car made its way back to the U.S. When it was restored, the original engine was mounted on a different chassis (as the original was shortened when it became a race car). The body was more or less constructed form scratch (perhaps utilizing what was left of the LeBaron coachwork). It’s still a beautiful car carrying one of the best bodystyles that you could’ve ordered. Does this car count toward the 36 SJ Duesenbergs built by the factory? Barrett-Jackson says so. I’d say so too, but someone might argue with that. In any case, it’s a fantastic, million-dollar automobile. You can read more about it here and check out more from Barrett-Jackson here. This entry was posted in Uncategorized and tagged 1929, auctions, barrett-jackson, cars, classic cars, dual cowl, duesenberg, j-292, lebaron, model J, model sj, phaeton, sj-292, sweep panel by classiccarweekly. Bookmark the permalink.